1) Read “Rediscover Catholicism” by Matthew Kelly – This book changed my vision of the Catholic church from stodgy and out of date to the most genius I have yet to come upon. If you’re struggling with any of the common issues, such as praying to Mary, fasting, the Eucharist, etc., Kelly explains it in an easy-to-understand way that makes sense in today’s world. It is FREE at DynamicCatholic.com. Go order your copy today! 2) Catholic Radio – I did not discover Catholic radio until halfway through RCIA and I could not believe what I had missed. Here in Indy, you can listen to Catholic Radio on 90.9 or 89.3. All day long are shows to help you learn about your Catholic faith. Teresa Tomeo and Al Kresta help you understand the issues of the day in light of the Catholic faith and shows like Open Line and Catholic Answers help explain some of the intricacies of the faith. Good stuff! 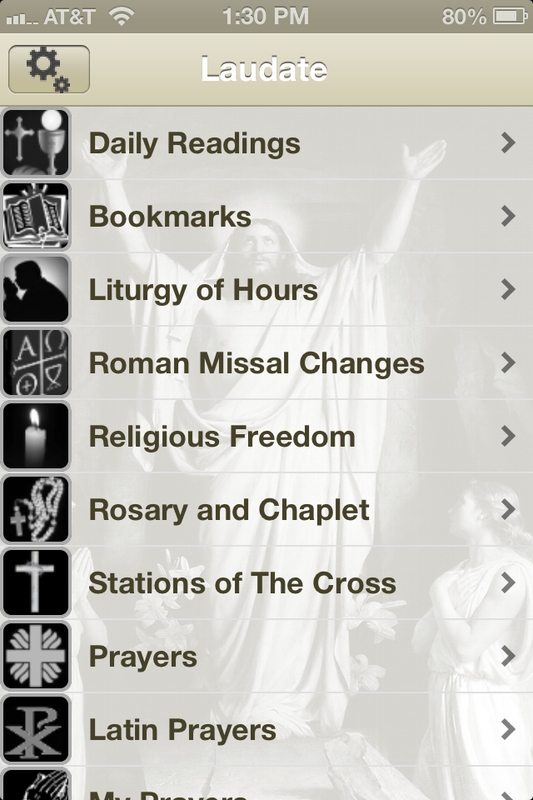 3) Laudate & Mass Times App – Now that you’re becoming Catholic, you should never miss mass! To help, use the Mass Times smartphone app when you travel to make sure you can find the closest churches and look up their mass times. Laudate is a wonderful free app that includes the daily scripture readings, saint of the day write up, a whole host of prayers, the complete New American Bible and so much more. All at your fingertips and FREE! 4) A Rosary – Honoring Mary is one of the most wonderful gifts you can give yourself. She is a loving, caring mom who if you ask her, will guide you on your Catholic journey. I began praying the rosary nearly every day early last summer and it’s such a blessing. Find a rosary online or at your local Catholic bookstore (there are some very inexpensive ones) or just use your 10 fingers! You’ll need to learn how to pray it, which is tough for a newbie. Real Men Pray the Rosary has a great explanation (see here), as does the Laudate app (in fact they have podcasts you can listen to so you don’t even have to remember what to say). 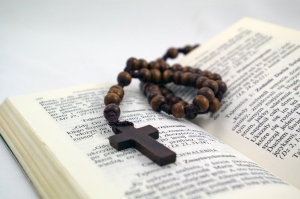 I recommend finding a pamphlet or printing out the Real Men Pray the Rosary one and following it until you have it memorized (it will take a while, no worries :)). 5) “The Catholicism Answer Book: The 300 Most Frequently Asked Questions” by Kenneth Brighenti – I had a TON of questions on the most basic tenets of Catholicism, especially on things like indulgences, praying to saints, why certain things are done at mass, etc. The best resource I found that answered nearly all my questions and explained things simply was “The Catholicism Answer Book.” I “checked it out” for free as a Kindle ebook from my local library, but you can buy from Amazon, too. What resources have you found to be helpful during the RCIA process? Let me know if you have any questions or concerns that I can help with as a recent RCIA candidate. Email me at [email protected]! Since I’ve now spent more than a year on this journey to Catholicism, I thought I’d share with you some of the many daily resources I’ve come across to stay up to date on all things Catholic. I thought it might save you the work of finding it all for yourself :). National Catholic Register daily email – This is a newspaper that is published weekly; however, they have a great website with wonderful, very down to earth columnists/bloggers and they send out a daily email with the Catholic news of the day. Great way to stay updated on Pope Francis’ speeches and other activities. Sign up here (click Register for our E-Letter at the top). They also are calling for donations to keep them afloat and provide us with news from a Catholic perspective (so helpful! ), so please help if you feel called: Donate to the National Catholic Register. Catholicism.About.com – This is another website who offers a regular email. They offer a very informed perspective on both daily Catholic news and the liturgical year. I like this one to keep me updated on novenas and special indulgence opportunities and thoughts on the liturgical year. Sign up here. ETWN TV – I just discovered EWTN TV during the Papal Conclave. I can’t believe I didn’t know about it before! It’s a tremendous resource not just for news (they offer daily shows in the evenings with a wrap up of Catholic news), but also Masses, rosaries and other prayers on TV. I’ve enjoyed shows so far about the saints and one during Lent from Bishop Timothy Dolan, as well as watched the announcement of the new Pope, his installation Mass and more. Good stuff. Check with your TV provider to see if they carry it. I have AT&T Uverse and it’s 562 on there. They also have good Catholic resources on their website. Pray More Novenas – This is an email that regularly sets up and encourages you to pray a select novena with thousands of other participants around the world. It’s helpful because they pray the particular novenas relevant to the liturgical season. For example, we prayed the Divine Mercy Novena leading up to Divine Mercy Sunday and we prayed a special novena during the Papal Conclave. They write and send the prayers every day and remind you to pray them. One of my favorites! Sign up here. Laudate iPad and iPhone App – Another of my favorites! This free app has tons of prayers, the entire New American Bible, the entire Catechism of the Catholic Church, Liturgy of the Hours/Daily Office prayers (which I try to do 1-2 times daily and it’s easy when it’s on my phone! ), a digital rosary, the scripture readings for the day, a reading on the featured saint of the day and lots more. So handy! Our bishop actually just mentioned it in a recent column he wrote. For Christ and The Church Blog – This is the blog of one of my church’s priests. He updates usually daily both with information about our parish, as well as great videos, texts from the Pope, spiritual thoughts for the day, his homilies and just generally great food for thought. The “Little” Books – I was given a variety of these throughout my RCIA process and loved incorporating them into my daily routine. They are small paperback books and they make them for Lent, Easter and Advent, as well as reflections on the four books of the Gospel. The books give you a daily tidbit about Catholicism (maybe about a saint or an event that happened on that day) and then they reflect on the scripture reading for the day. It can be done in less than 5 minutes and is a great spiritual “shot” to boost you for the day. They are very inexpensive ($2 for one with $1 shipping!) and you can buy them here. These are all resources that I use on a daily basis. How do I work it in? Usually I pray the Liturgy of the Hours around 9 a.m. and before bed, using the Laudate App on my iPad. I read my National Catholic Register and Catholicism.About.com emails, as well as any updates from the For Christ and the Church blog while waiting in line or after dinner and before the kids go to bed on my iPad or iPhone. I usually set my DVR to record shows on EWTN that I’m interested in and then watch them when I have time. At noon, I take a work break and starting today am incorporating a prayerful hour daily (more to come on that). So I work in my Little Books daily read then along with any novena prayers that are relevant for the day, as well as the daily scripture readings and Saint of the Day on my Laudate app. It really does not take all that much time when it’s all said and done with these very helpful Catholic resources. What are your go-to resources for Catholicism? Please share! I love to find great new resources!